Shopping for a fashion-obsessed friend, daughter or sister? 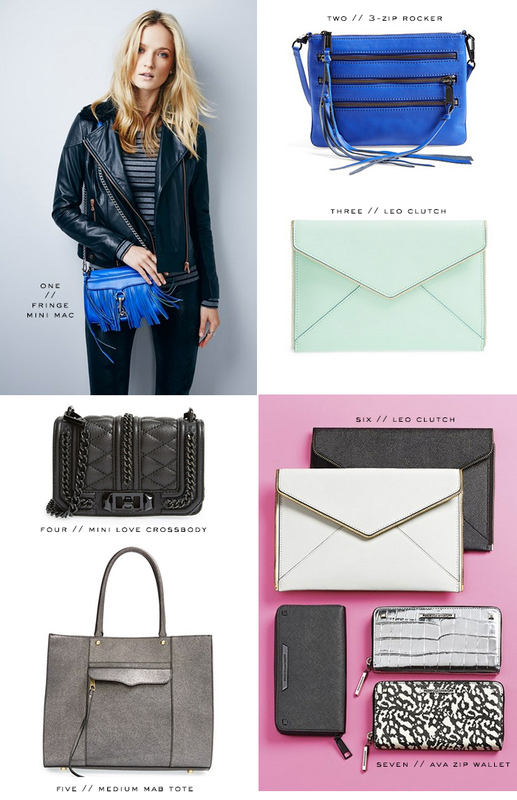 Look no further than Rebecca Minkoff handbags. Rebecca’s pieces are fashion-forward, fun and youthful, incorporating lots of color, sleek design and amazing accents like fringe, zippers and studs. If you’re not looking to spend a whole lot, this clutch is under $100 and a pretty piece that will become a staple in her closet – and how cool is that zippered edge?! I’m actually thinking of picking one of these up for myself. If the girl you’re shopping for loves to make a statement, the fringe mini MAC is a definite show stopper – especially in the bright blue! This style is an exclusive collaboration between Rebecca and Nordstrom and only available here! The crossbody style is my favorite, wear-everyday style and is wonderful for travel – if fringe isn’t your thing but you still want that style, be sure to check out this chain-adorned crossbody or this one. If you’re looking for practicality and a good basic, this tote is a dream! It’s such a great size (not too big), and the metallic black shade of leather will make any scuffs (if it even gets any) practically invisible. Now I know we’re talking about bags today, but I do have to mention some clothes and shoes I found since they are so fab. I’m dying to get these studded jelly sandals for spring/summer, and this quilted sneaker would be great to finish out fall/winter! For clothes, this printed maxi dress is everything. Also loving the sporty chic look of this light mesh midi skirt. Shop all this and more great gift ideas at Nordstrom! The love crossbody is so cute. I have to admit I love RM handbags… I have two (the mini and big mac) and use them all the time! I’m a big fan of these bags! She has some of the best bags from the shape to the colors, love! Love the fun details on these bags! Rebecca Minkoff makes the most amazing bags. They are edgy, sweet and cool! I have a few on my Christmas list, and I can’t wait! Hmmm…I can’t decide on a favorite! Loving the Leo clutch and the medium Mab tote! One of my favorite designers. Love the mini love. That fringe cobalt is JUST TOO GOOD! I have a few RM bags (her sample sales are just too good) and loving her latest ones!